There are now over 20.8 million people with diabetes in United States alone. And it is continuously growing. Diabetes or diabetes mellitus is a disorder in which blood sugar (glucose) levels are abnormally high because the body does not produce enough insulin. Insulin, a hormone released from the pancreas, controls the amount of sugar in the blood. When a person eats or drinks, food is broken down into materials, including sugar, that the body needs to function normally. Sugar is absorbed into the bloodstream and stimulates the pancreas to produce insulin. 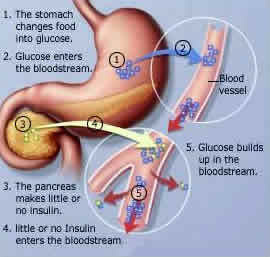 Insulin allows sugar to move from the blood into the cells, once inside the cells, sugar is converted to energy. Which is either used immediately or stored until it is used. If the body does not produce enough insulin to move the sugar into the cells, the resulting high levels of sugar in the blood and the inadequate amount of sugar in the cells together produce the symptoms and complications of diabetes. Is an autoimmune disease that occurs when T cells attack and decimate the beta cells in the pancreas that are needed to produce insulin. The pancreas makes too little insulin (or no insulin). Without the capacity to make adequate amounts of insulin, the body is not able to metabolize blood glucose (sugar), and toxic acids (called ketoacids) build up in the body. There is a genetic predisposition to type 1 diabetes. The disease tends to occur in childhood, adolescence or early adulthood (before age 30) but it may have its clinical onset at any age. The symptoms and signs of type 1 diabetes characteristically appear abruptly, although the damage to the beta cells may begin much earlier and progress slowly and silently. Is the type in which the beta cells of the pancreas produce insulin but the body is unable to use it effectively because the cells of the body are resistant to the action of insulin. Although this type of diabetes may not carry the same risk of death from ketoacidosis, it otherwise involves many of the same risks of complications as does type 1 diabetes (in which there is a lack of insulin). Increased thirst and frequent urination. This diabetes symptom is common with type 1 diabetes, excess sugar (glucose) builds up in your bloodstream. A high level of blood glucose pulls water from your body's tissues, making you thirsty. As a result, a symptom of thirst or you drink more fluids and urinate more. The excess sugar in your bloodstream passes through your kidneys and leaves your body in your urine. Extreme hunger. Another diabetes symptom of type 1 diabetes is extreme hunger. Because of inability to produce insulin, the hormone necessary for glucose to enter cells and fuel their functions — leaves your muscles and organs energy depleted. A symptom of hunger makes you feel like eating more until your stomach is full, but the hunger persists because, without insulin, the glucose produced from dietary carbohydrates never reaches your body's energy-starved tissues. Weight loss. Despite eating a lot to relieve their constant hunger, another diabetes symptom of people with type 1 diabetes is rapid lose of weight. That's because the body's cells are deprived of glucose and energy, as glucose is lost into the urine. Without the energy glucose supplies, cells die at an increased rate before they can divide and replace themselves. Muscle tissues and fat stores shrink, and body weight declines. Blurred vision. Another diabetes symptom is blurred vision. A high level of blood glucose pulls fluid from all your tissues, including the lenses of your eyes. The decrease in fluid affects your ability to focus. Fatigue. A diabetes symptom that occures when your cells are deprived of glucose, you become tired and irritable. Slow-healing sores or frequent infections. This diabetes symptom affects your body's ability to heal and fight infection. Bladder and vaginal infections can be a particular problem for women. Red, swollen, tender gums . This diabetes symptom is due to the infection in your gums and in the bones that hold your teeth in place. Your gums may pull away from your teeth, your teeth may become loose, or you may develop sores or pockets of pus in your gums — especially if you have a gum infection before diabetes develops. Treatment of type 2 diabetes also starts with home blood-sugar monitor testing. But only a fraction of people with type 2 diabetes need insulin injections. Most can be controlled with blood sugar dietary changes, regular exercise and oral medications. If you are diagnosed with type 1 diabetes or type 2 diabetes, you should definitely must be under doctor’s care and management. And you should never stop using your medications or injections, or alter your dosage, without your doctor’s approval. To enjoy a healthier lifestyle even if you are afflicted with diabetes, you may follow some simple suggestions using blended medicine. Though the following suggestions are more tailored for type 2 diabetes. If you find this site helpful, help us grow. M. Castleman "Blended Medicine, The best choices in healing, Diabetes "
Blakemore AI, Froguel P (2006). "Genetics of obesity and the prediction of risk for health". Hum. Mol. Genet. 15 Spec No 2: R124-30. doi:10.1093/hmg/ddl215. PMID 16987875. Barrett TG (2001). "Mitochondrial diabetes, DIDMOAD and other inherited diabetes syndromes". Best Pract. Res. Clin. Endocrinol. Metab. Seidell JC (2000). "Obesity, insulin resistance and diabetes--a worldwide epidemic". Br. J. Nutr..